Jaroslaw Czarnecki (Dr.) / Elvin Flamingo (PhD) is an artist based in Gdansk who is working on the long-term project “The Symbiosity of Creation”. Prof. Dr. Nellen is Di­rec­tor of the De­part­ment for Bi­ol­o­gy and Ge­net­ics at the Universität Kassel. He is active in nu­mer­ous na­tio­n­al and in­ter­na­tio­n­al so­ci­eties for ge­net­ics, bio­chem­istry and molec­u­lar bi­ol­o­gy. Prof. Joel Bau­mann is a pro­fes­sor for New Me­dia and Dean of the Kun­sthoch­schule Kas­sel. He is also founder of the new-media collective tomato interactive in London. Prof. Jens Brand is an artist and pro­fes­sor at the Kun­sthoch­schule Kas­sel. Martin Hen­niger studies Ge­og­ra­phy, His­to­ry and Bi­ol­o­gy and is a research fellow for Mod­ern His­to­ry at the Universität Kassel. Char­lotte Her­mann studies Art at the Kun­sthoch­schule Kas­sel and Philo­so­phy at the Universität Kassel. Amelie Jakubek studies Art at the Kun­sthoch­schule Kas­sel and So­ci­ol­o­gy at the Universität Kassel. Ru­di Mey­er studied Sport Sci­ence at the Philipps-Uni­ver­sität Mar­burg and studies Art at the Kun­sthoch­schule Kas­sel. Dr. Frances­ca Miche­li­ni is a research fellow at the In­sti­tute of Phi­lo­so­phy, Universität Kassel and a mem­ber of the LOEWE pro­gramme: Tier-Mensch-Gesellschaft. 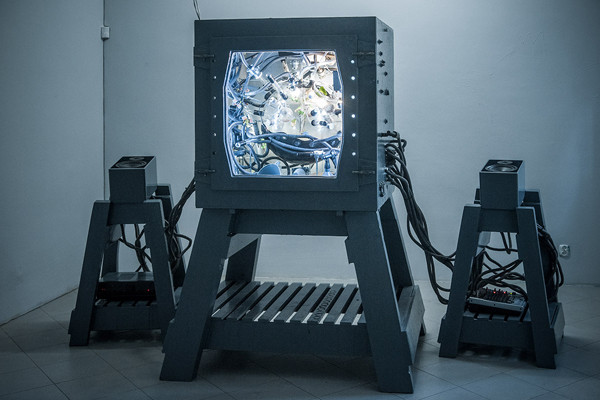 Rüdi­ger Tro­jok is developing a ci­t­izen sci­ence bio­lab in Ber­lin and sup­ports open source biotech­nolo­gy in art, politics and the public sphere. Ja­na Buch­mann, who studies Art at the Kun­sthoch­schule Kas­sel and Bi­ol­o­gy at the Universität Kassel. Prof. El­la Zie­gler, an artist and pro­fes­sor at the Kun­sthoch­schule Kas­sel. Lu­cy Pow­ell, an artist and ini­ti­a­tor of the Satel­lite Sa­lon for art sci­ence con­ver­sa­tions in Ber­lin. Prof. Heike Kluss­mann, an artist and Pro­fes­sor for Art and Ar­chi­tec­ture at the Universität Kassel.